The Netherlands is a collection of countries within a country but that’s just politics. For the visitor, the Netherlands is all about tulips and windmills, dikes, bicycles and coffee houses. The history of the Netherlands is a history of shifting borders. The Dutch United Provinces declared their independence from Spain in 1579; during the 17th century, they became a leading seafaring and commercial power, with settlements and colonies around the world. Every school child reads of the power of the Dutch East India Company. A Kingdom of the Netherlands was formed in 1815. In 1830 Belgium seceded and formed a separate kingdom. 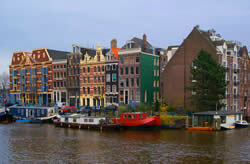 Today, the Netherlands is one of the most popular destinations in Europe for visitors from North America. The Netherlands remained neutral in World War I, but suffered invasion and occupation by Germany in World War II. It has become the home of the International Court of Justice, situated in The Hague. The city of Amsterdam offers many museums and art galleries such as the Van Gogh Museum, the Stedelijk Museum of Modern Art, the Rembrandt House and the Amsterdam Historisch Museum. With Dam Square at its center, Amsterdam is surrounded by quaint canals and stone-cobbled streets, multi-colored three story homes and a wonderful tavern and pub life. Even the most puritanical of visitors to Amsterdam find their way to the notorious Red Light District. Keep your camera put away, however, as photographers are not welcome! Yes, marijuana is sold in the “coffee houses” but it is not legal, just tolerated. Amsterdam’s hedonistic side is on the wane as newly enacted laws have trimmed back on the scope of the Red Light District and marijuana use. Holland was once mostly a set of islands, precariously separated from the North Sea by dunes. The Dutch managed to pull together the islands using a clever system of wall, levies, dikes and a lot of hard work. Much of the nation is below sea level. Let’s get the terminology straight: the Dutch refer to themselves as Nederlanders. “Dutch” is an English corruption of “Deutch” or “German”. However, the Nederlanders are comfortable with either term. “Holland” is really in reference only to the northern provinces of Noord-Holland and Zuid-Holland, not to the entire country. Top Specials to the Netherlands! World War II Memorial Tour Revisit the dramatic history of World War II and enjoy the beauty of Europe through this landmark itinerary. Image Tours will bring you to famous battle sites, war museums, and memorials. Scenic and cultural highlights are also included, making this tour an enjoyable combination of learning, sightseeing, and reflection. Heart of Europe® with Passion Play The itinerary offers the perfect combination of seven countries, enchanting cities, wonderful local flavor, and the Passion Play which is performed in the picturesque Bavarian village of Oberammergau, Germany. Performances are limited to every ten years, with the next performance taking place in 2010.